The Riddell Phenom AP Adult Football Pads – All Purpose will help you stand out from the crowd on the field. The slender design keeps your body movement unrestricted for maximum agility, all while providing you with the Riddell quality protection. 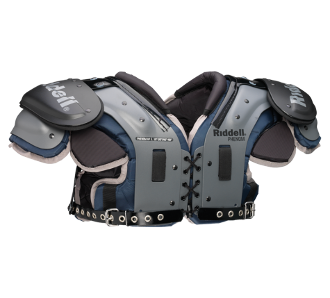 Recommended for linebackers, linemen and fullbacks, the All Purpose Riddell Phenom Shoulder Pad has an adjustable Y-belt closure system and a mid-length arch to lock you in on game day.